These are the marriage license and record documents for my great grandparents, John Robert Kelly and Minnie Pearl Peterson, which also names my great-great grandparents on each side. The marriage license was issued on 12 Oct 1903. The marriage record was recorded on 15 Oct 1903. The groom is listed to be John Robert Kelly of Bancroft, Nebraska, being 24 years of age. 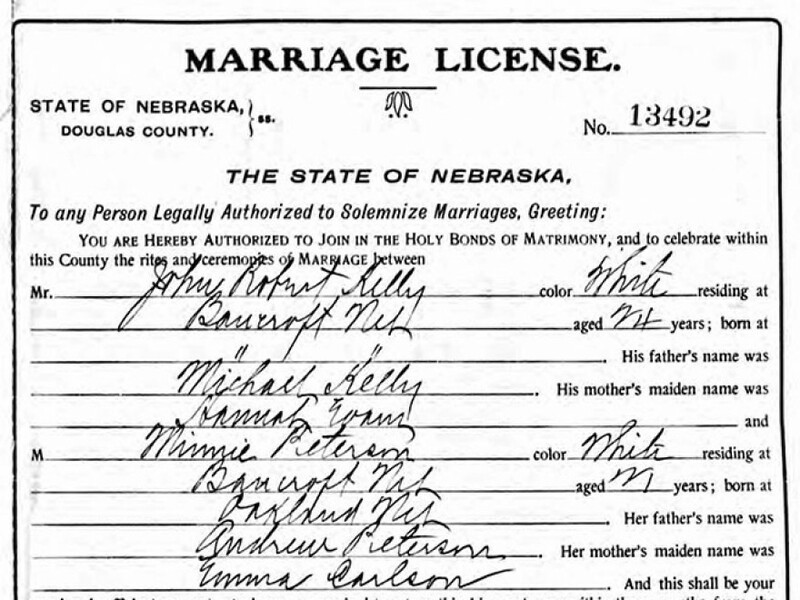 The bride is listed to be Minnie Peterson of Bancroft, Nebraska, bring 21 years of age. The groom’s parents are Michael Kelly and Hannah Evans. The bride’s parents are Andrew Peterson and Emma Carlson.